A dinghy is a small boat with a sail and rudder. It’s the smallest class of sailing vessels, and also the simplest. 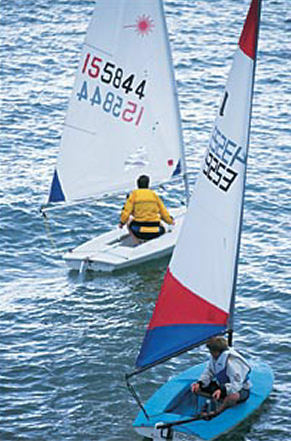 Learning to sail a dinghy is often the first step for beginners on the way to sailing bigger and more complex boats. As arguably the easiest of all the sailboats to master, Dinghy training lets you build out a basic level of skills on the ocean and gain some understanding of the mechanics of motion of boats in the water. Why are Dinghies so Good For Beginners? The reason lies in their responsiveness to your movements. Unlike keelboats, there’s no time lag between the actions of the crew and the movement in the water. You’ll instantly see the fruits of your actions – whether that’s the boat lurching to one side with sails flapping, or in a more desirable scenario, catching a nice gust of wind and making progress in the direction you intend. The close coupling of action and response provide a strong feedback loop for you to pick up fundamental sailing skills. What Exactly Is A Sailing Dinghy, And What Are It’s Components? A sailing dinghy is usually between six and twenty feet in length. The mast and sail are located towards the front. A rudder is positioned at the rear, and there’s usually a retractable centerboard which extends down under water from the middle of the ship, and acts as a kind of central rudder. If you want to learn how to sail a dinghy, you’ll need to develop an ability to operate some of the kit above, and all of it if it’s a one man vessel. As you’d expect, the general aim of dinghy sailing is to use the rudder to point the dinghy 45 degrees into the wind to catch it and generate forward motion. The centerboard is used to counter the force from the sails, allowing the crew a degree of choice over the direction in which to steer the boat. If you’ve seen sailors leaning precariously far out over the side of their boat, you’ll know there’s at least one more skill involved in how to sail a dinghy. In addition to these instruments, side-to-side balance is key to dynamic sailing and staying afloat. The reason for this is that because dinghies are so light, the position of the crew has a significant impact on the center of gravity of the whole vessel. By shifting your weight as you make movements in the water, you’ll be able to make sharper changes of direction and make corrections to keep the boat afloat in turbulent waters. This skill is one of the most impressive abilities that you’ll see performed by experienced dinghy racers. 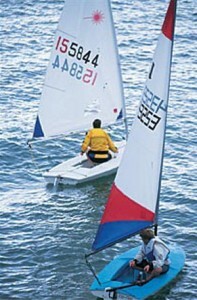 Of course, the best way to learn how to sail a Dinghy is to take a training course with experienced instructors. The RYA offer a Dinghy course aimed at teaching sailing to beginners and getting beginners up to speed on the water. To find out where you can take a basic RYA Dinghy sailing course in the UK, make your way over to our courses and training centres pages. We’ll get you on the water with the wind in your sails in no time at all.